Present: Howard, (Chairperson) Alan, (Vice-Chair) Alison, (Secretary) Elaine, Haley (Elaine’s PA) John, Claire, Bill, Gordon, Dave. 1) High Peak Access’ Photo-Shoot covered 113 miles. Start time: Glossop 8.45 am – Finish Time: Glossop 6.15 pm. 2) Lunch for 11 people @ the Waltzing Weasel, Birch Vale, High Peak. 3) Peter took photographs of each location visited. Accessible Parking Bays – although there are 6 accessible parking bays, only one was operational i.e. four were covered by building equipment, one bay was occupied by a driver of a ‘Works Van’, and the one remaining bay was occupied by a disabled driver i.e. Blue Badge Holder. Action: Alison will write to the University. Ramp – the interim (not finished) ramp into the University is 1 in 10, but should be 1 in 15, or 1 in 20 (external ramp) Action: Elaine enquired at the Administration Office to see the plans for the modernisation/refurbishment of the University premises. A simple plan was produced, but it did not contain dimensions etc. and thus, Elaine requested the contact details of the Planning Officer, this information was duly provided. 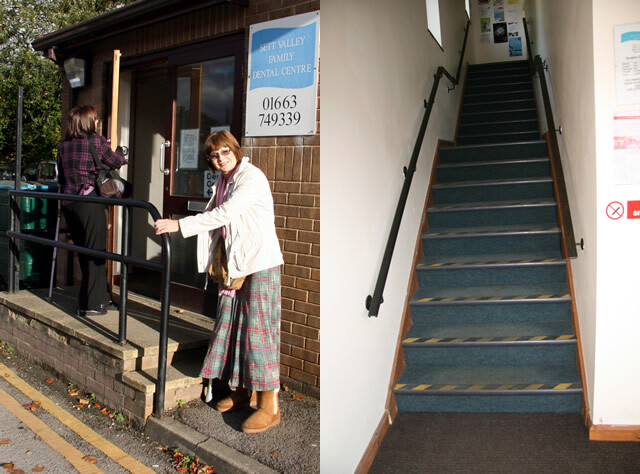 Action: Elaine will contact the Planning Officer, and also ask questions about the new location(s) of the accessible parking bays. Group members were/are concerned about pedestrian access to Morrison’s’ from Dale Road. From Morrison’s car-park, the pedestrian access route to the store is accessed by sloped steps into the Park. Steep Rise 1 in 6 (approximately) this route begins at the car-park. 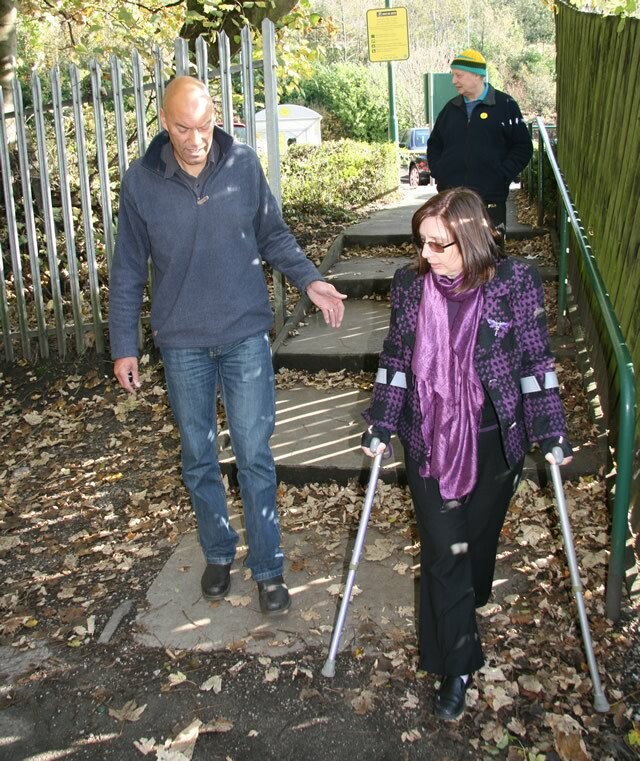 The pavement adjacent to Ashwood Park is not wide enough for a wheelchair User – the User has to use the grass verge. The Bus Stop stops 150 yards up Dale Road – after which pedestrians must negotiate the busy roundabout – 2 roads, with no pedestrian crossings. Action: Elaine, Claire and John to confirm the width of the pavement (Ashwood Park). There is a designated car-park for disabled car drivers. The car-park is well maintained, and thus Dave was able to park the Community Bus. 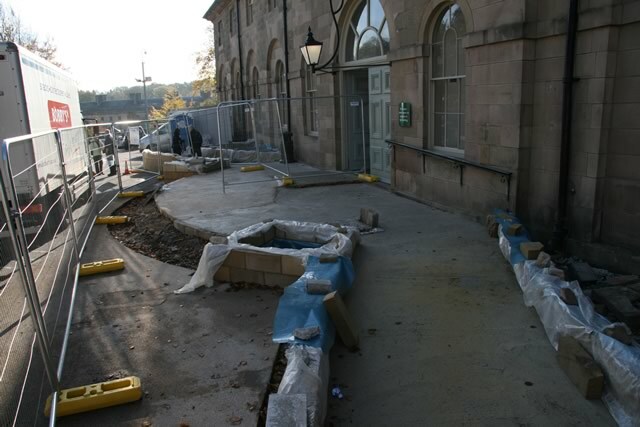 However, the access route from the car-park to the Promenade is currently inaccessible for Disabled People, Elderly People, and parents pushing pushchairs, etc. – i.e. the beginning of the route measures 1 in 6.5 and the exit of the route 1 in 5. This route is too steep. Action: Alison will contact the Peak Park with the Findings. The Macclesfield Road junction (B5470) - leading into Whaley Bridge has narrow pavements and sharp corners, (both sides of the road) therefore, Wheelchair / Scooter Users, pedestrians, parents pushing pushchairs are forced onto the busy main road. One side of the road/corner has a railing and bollards. 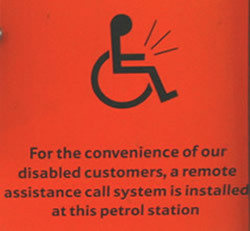 Tesco Petrol Station at Whaley Bridge operates a ‘Ready Call’ / ’Service Call’. Disabled Drivers can purchase a Service Call transmitter @ £14.95. It sends a radio signal to a remote bleeper. This bleeper can be positioned up to 50 metres away, including through walls, from the receiver and will bleep until it is reset by a member of staff; thus, ensuring that the disabled customer has good service. The Waltzing Weasel, Birch Vale, High Peak – group members were surprised that the Waltzing Weasel did not have an accessible toilet. Alison booked the Pub for lunch, stating that three people were Wheelchair Users, but was not told of the lack of facilities. Therefore, Dave had to drive the Community Bus to New Mills Leisure Centre, the nearest Accessible Toilet. Action: Alison will write to the Landlord reminding him of his duty under the Equality Act, 2010. A second seat should be installed, as a person changing from the swimming pool/shower, will have to use a wet seat. 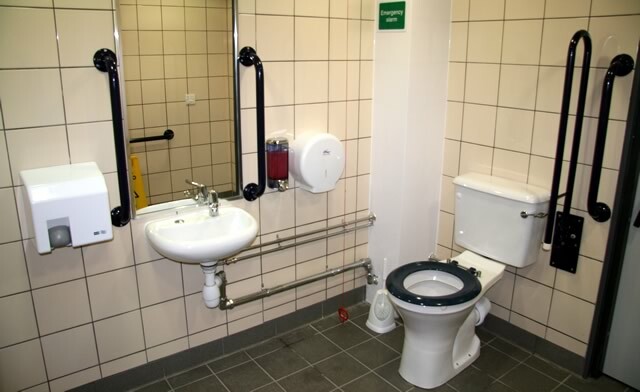 Note: the accessible toilet should be independent from the changing room. 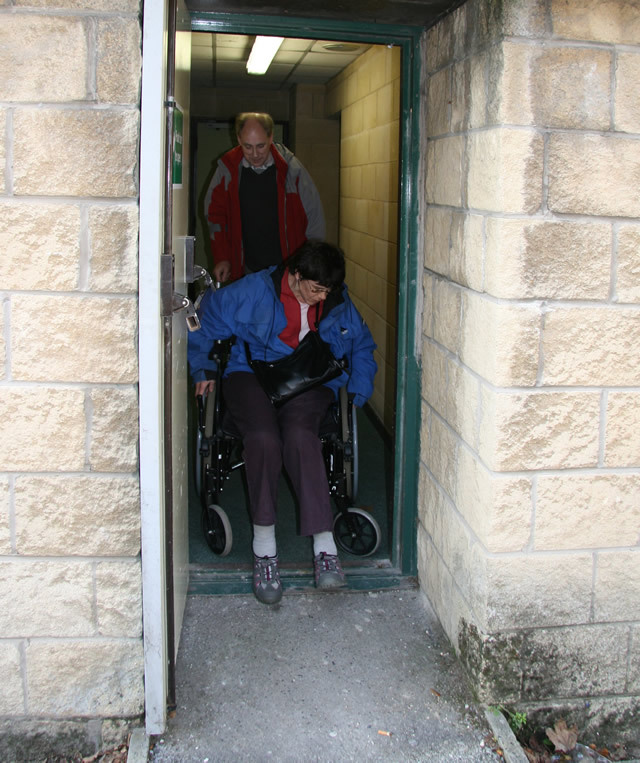 Claire accessed the Fire-Door from New Mills Leisure Centre: This was difficult to access independently, as the fire door opens outwards, and thus, a Wheelchair User needs assistance. Claire had to keep her arms tucked into the wheelchair, as the entrance was too tight – scraped the Wheelchair. 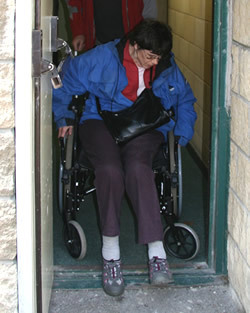 A larger/ or motorised Wheelchair User would not be able to access the fire door. These facilities are not accessible for Disabled People with Mobility problems / impairments; elderly people and parents of young children. We need to campaign for access. Questions to ask: What alternative service do they offer for disabled people, elderly people and parents of young children i.e. babies? Action: Work with Derbyshire Link.